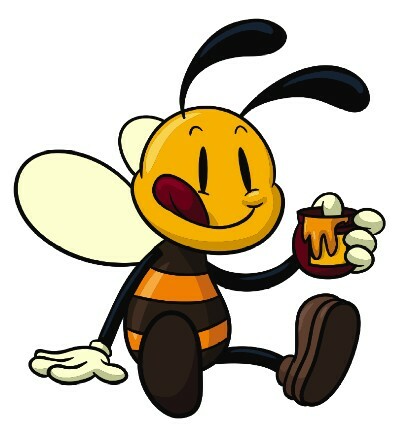 Honey is what bees eat. But a honey bee doesn’t eat from a flower – she’s there to collect watery nectar, which she swallows into her storage stomach (pollination is the flower’s reward). She flies the nectar back to the beehive where it’s made into honey. In the beehive, she passes the nectar (mouth to mouth) to other bees who transform it. 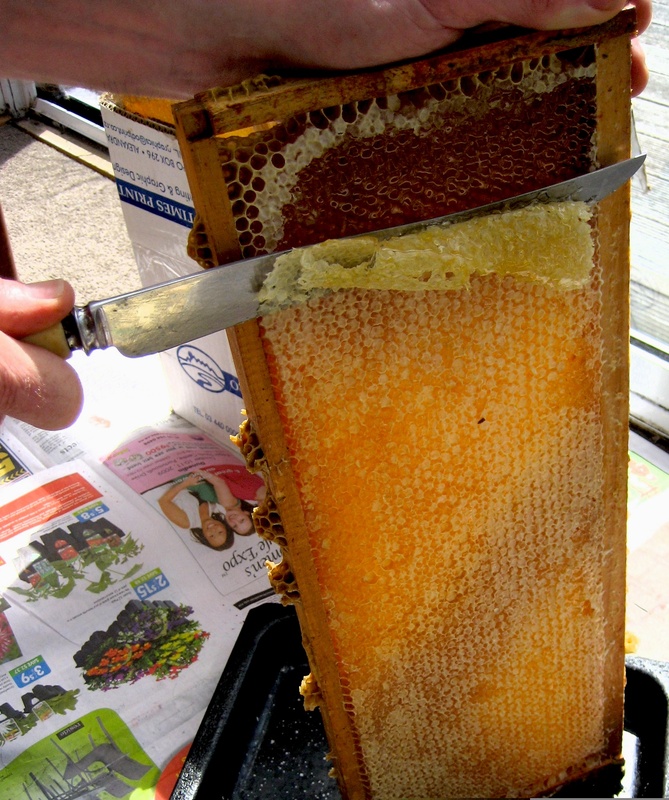 First the nectar is mixed with enzymes in the mouth, then they spit it into honeycomb cells. Next, the bees thicken the honey as a chef thickens a sauce: fanning it with their wings to evaporate the water (nectar is 70% water). Lastly, the thick honey (<20% water) is sealed with wax. Honey is high in sugar and bees get energy from it. But bees also need to eat pollen: a food rich in protein, fat, vitamins, and minerals. Honey is a miracle — a treat eaten straight from nature, needing no preparation, cooking or preserving. It’s the only food made for us by insects. Bees visit over 2 million flowers to produce a 500 ml jar of honey. My favourite honey is Tawari honey from New Zealand. Photo: I remove the wax ‘cap’ before spinning the honey out. Scientists have proved that honey kills bacteria. New Zealand manuka and Australian jelly bush honey have the strongest anti-bacterial power.